Discussion makeshift golf net- Garment rack and tarp- will it work? makeshift golf net- Garment rack and tarp- will it work? hey guys ive been doing some research for an indoor golf net. 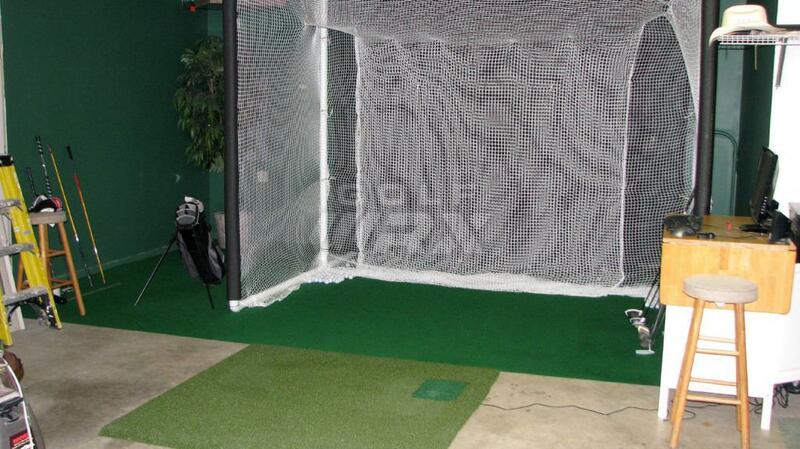 it seems like all the golf nets in the $100 price range just isnt pretty good. what do you guys think about getting an industrial garment rack for around $75 and putting a piece of tarp over it? the rack will be about 6 feet wide by 5 feet tall. do you guys think this will work? main goal is to practice short and mid irons, but who knows. Or PVC pipe and a net or tarp. Of course you may have to weight the bottom some. I made one with PVC and an old sheet attached with tie wraps. Worked well until it got mildew from the rain. I didn't realize that it was loose until I hit driver into it and the ball kept going. Thankfully I was pointing at a wooded vacant lot and the ball just hit the trees and dropped. Definitely going with a weather resistant tarp next time. How high should the net be? I'm 6'6" and have a high ball flight. My problem is that I don't know how high I should get the net too. I never thought of using PVC piping to make mine set up properly. Thanks. I took six 12 foot sections of PVC. I used 3 to make the front - 1 flat on the ground and the other 2 forming an arc and meeting in the middle (think of a "D" laying on it's back. Two more met it an identical arc flat on the ground behind the opening. The final piece connected the two arcs and acted as a brace. I would say that the arc reached about 7 feet and was plenty tall as long as I got as close to the bet as I could without hitting PVC on my follow through. I'm only 5'9", but hit the ball pretty high so I don't know if body height has anything to do with it. I doubt any if that made sense. I built mine out of 2 inch PVC. I was going to buy one already made but everything seemed basicly cheep looking and spendy so I decided to build my own. I figured I could build something better then I could buy for the same money. 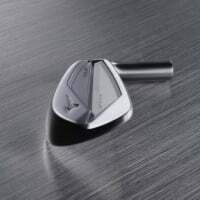 With mine I can hit any club in the bag including the driver and the ball just drops gently to the floor. 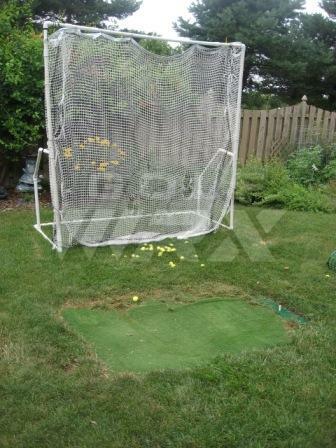 I added an extra piece of netting on top angled down about two feet so I can hit lob shots with a 64 degree wedge. The ball goes almost straight up but still hits the net and falls to the floor. My hitting surface is a kingsize comforter first, then a black mesh tarp and finally the net. The comforter and tarp take all the impact making the net last a lot longer. No fear of blowing a ball through the net. There are two kinds of netting. Knotted and wooven. Get the wooven. The spin of the ball will trash a knotted net much faster then wooven. If I can be of any help with your project, let me know. That's awesome! How much did that run you for materials alone? The great thing is PVC is cheep and very well suited for this project. Its easy to cut and durable. I did a lot of things I didnt have to do because I wanted it last and look good at the same time. The net is the spendy part. The comforter was like 25.00 at walmart. I ordered the tarp for like 30.00. I think the net was around 130.00 if I recall. For a couple of hundred bucks and a little imagination you can make something really nice. Much better then anything you can buy already done. This thing is a tank!! It'll last a lifetime. Everything I looked at seemed rickety at best, cheep and over priced at the worst so I decided to build my own the way I wanted it. I could coustom build it to the space I had. Let me know if I can with your project, Id be glad to do it. thanks for info guys. I have a net froma cheap one that I bought, so i'll just get the pvc piping to make the frame. heres another way to do it, even more cost effective. Net from Walmart is $20. I measured so it fits inside my heated garage for winter hitting too. You can build your own cage out of PVC or EMT and add side netting bought on ebay for cheap. I've had the PR-20 and use it as an impact screen with my simulator for the past 3 years without a scratch or pucker mark. You could go with an 8' x 8' archery net on the same page for around $65. I recommend their products. where did you get the netting? also im looking to do this in my garage?